DeskLampX Redux from developer Alf, listener Larry’s workaround to Parallels installation when you need to insert a second disk, Synergy gui and review from listener Bart, michaelharvee.com on Here’s How to Talk podcast, Ian and Allison battle it out over the need for anti-virus on the Mac, listener Leonard’s suggestions on using Sidenote from chatelp.org, SightSpeed from sightspeed.com for free cross-platform video chat, review of 8 wiki’s from wikimedia.org, tutorial on how to put YouTube video on your iPod, Time Warner gets two points. I know you’re not going to believe this, but Quality control director Steve has reported that he was unable to find any flaws in last week’s show. He didn’t actually say “flawless” but it’s about as close as he’ll ever get. He chose not to count word pronunciation missteps as flaws, lucky for me. this week was a feeding frenzy of listener feedback, it was GREAT! Keep this up – you guys are way more interesting than I am by myself! Anyway, Alf from Desk Lamp wrote back to me immediately, asking me what version i was running and asked me if I would send my crash logs to him so he could do some diagnostics. Isn’t that cool? Yet again why I love shareware and open source tools – can you imagine getting this reaction if you had a problem with Excel or iTunes??? It turns out that I didn’t have a Desk Lamp.crash.log in my home directory’s library folder. I had many other crash logs by application name, but not that one. I took Desk Lamp off my system after testing, but I decided to reward his enthusiasm for a less-than complimentary review with trying to replicate the issues I had. I reinstalled and did a search on desklamp, I clicked on the right column view, and got the spinning gear for a while, then the spinning pizza wheel of death joined in. I then pulled up force-quit, and got “not responding” on Desk Lamp. I left it waiting for me to hit force-quit while I wrote up these notes to Alf and eventually the application DID respond after all. It looks like DeskLamp wasn’t actually crashing, but just hanging up somewhere along the line. I sent all of this to Alf with screen shots, so I know he’ll be working out the snags and get back to me when they’re fixed. He said he’d make sure I got new versions when he got them out. I am now a big fan no matter how this turns out! I’ll keep you posted when he writes tome. Listener Larry watched my video tutorial on installation of the Parallels Virtual Machine that allows us to run Windows and Linux on our Macintoshes, and he had a great workaround to a problem I had. In the tutorial I explained that you had to have your guest operating system install on a single disk because Parallels didn’t understand the concept of ejecting one disk and putting in the next. I had this problem when I tried to install Linux because it was on 4 CDs, so I downloaded the DVD distribution to get around the problem. Larry faced the same problem because he had an XP upgrade disk and the installation required that he insert his original Windows 2000 disk to verify his installation was legitimate. Here’s how he tricked Parallels into accepting two disks. He started the installation, and when the Windows installer asked for the Win2K disk he paused the virtual machine. That’s a weird concept – when you’ve got Parallels running with a guest OS you can simply pause it and then quit Parallels and the next time you want that OS you just “Play” the virtual machine and it comes up right where you left it without having to reboot. Hope that makes sense. Anyway, so he paused Parallels, closed it, and returned to the OSX side. Now OSX “owns” the CD drive again, so he was able to eject the CD. Then he opened Parallels again and started the virtual machine and inserted the requested CD. I never would have thought of this path, and it’s a little slow (takes a couple of minutes to pause and play the VM but it’s creative and it works! Hope this helps some of you out there, thanks for the great workaround Larry. Hi Allison, I use synergy at work to link my Mac and my Linux box and although I’m not at all afraid of the command line I do like to avoid it when I can. Anyhow, you might be interested in this posting on my blog (bartbusschots.ie) which has a link and some nice screen shots of a GUI for synergy on the Mac. Been using this for almost a year now with zero crashes so far. Hope it helps! I’ll have to give this gui a try some time, sure could use the help. thanks for the great tip Bart! I’m really happy to hear that Michael – of course I have my “slight” bias but I really try to work towards an unbiased world where everyone helps each other. I know, i can hear all of you singing Kumbaya around the campfire with a tear in your eye over that line, but I really mean it. Michael became even more interesting as he pointed me to his two podcasts hosted at michaelharvee.com. One is called “Hears How to Talk”, and it’s wonderful. His tag line is “say what I tell you and no one gets hurt”. He looks at idiosyncrasies in language and how we pussyfoot around each other in our words and don’t say what we really mean. I think I like his podcast because of it’s total irreverance. They’re only about 5 minutes long each, so they really left me wanting more! now I have to check out his second podcast, “Odd TV”. I haven’t quite figured out what this one is yet, but based on Hears How to Talk, I bet I’ll like it. thanks for some good humor Michael, and thanks for writing! So a couple weeks ago I mentioned that I don’t run any virus/spyware/adware on my Mac, and a listener wrote in and reminded me that I’m running Windows on my Mac and shouldn’t I mention that it still has to be protected. I did a clarification last week to make sure you guys knew that. then this week listener Ian and I engaged in an interesting debate on whether OSX should be protected as well. I’m not sure Ian and I see eye to eye on this yet, but I think I get part of his points. Ian believes that we should run anti-virus on our Macs because there will come a time when a virus comes out and we’ll be at risk when that happens. My point is that since there aren’t any viruses for the Mac, I’m not sure what they’re scanning for with the virus software you can buy today. Virus definitions, which have to be updated regularly are the files that describe to the scanner what the current viruses look like, so what would a virus definition file for the Mac have in it? Ian did point out that the macro viruses that were rampant in the early ’90s are still out there, but now the Office products which were the target scan for macro’s and warn you before you enable them so you have a chance to say no if the file you’re opening shouldn’t have a macro. I don’t know for sure whether current versions of Office can even be infected, but I suppose it’s possible. The place in our discussion where Ian won me over was in his insistence that I realize that I may have other protections in place that other people don’t. If I did get attacked by a virus and I had to rebuild my system, I wouldn’t have a real hard time getting back up and running. I own my operating system and I know where the DVDs are, I know how to do a reinstall easily, I have weekly backups running so my data would be easy to put back. I own all of my software (and again I know where the CDs are) and I have backups of all the installer files and my registration codes. . It would take the better part of an afternoon, but compared to the time to scan every file I downloaded in the last 5 years, and to do full scans of the disk once in a while, I think it’s a good trade-off. By the way, I am also protected by a hardware firewall which eliminates attacks on the operating system, which are a bigger risk today than a virus attack. My advice to you is to run virus software if it makes you feel safe, but I still wouldn’t do it. Take my advice and keep those backups running so you’re not wrecked if and when a virus does come along. Your highest danger today is of course a hard disk failure, so that’s why you should be running backups anyway! Listener Leonard was looking for an easy Mac application where he could log his phone calls, something that would be available all the time and easy to work with. Before I could find something for him, he wrote in and told me that he uncovred an interesting little freeware application for OSX called Sidenote from chatelp.org. 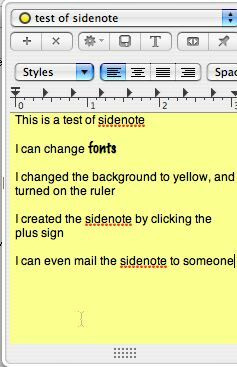 Leonard described Sidenote as a sticky note type thing that pops up when you slide your cursor tot he side of the screen, and disappears when you move your cursor away. Leonard offered to help me if I got stuck with it, which turned out to be an offer I took him up on! I downloaded the disk image file for Sidenote, and it gave me the traditional icon to drag to to my Applications folder. I did that, and double clicked the application, and nothing happened. Double clicked it again. Hmmmm….resorted to reading the readme file, which said the application would open when I dragged my cursor to the corners of the screen. I dragged all over and nothing happened. I had followed their instructions to add SideNote to my startup items, so I thought maybe if I logged out and back in it would load properly. When I logged out it closed all my open windows…except one…there was a SideNote window congratulating me on my choice of loading it that was waiting for me to click ok, and it was hiding underneath all my other open windows! And that’s when I realized what my next problem would be – it told me that it was going to helpfully put itself on the left side of the screen….which would be fine except that’s where my dock lives! When it finished logging me out and back in, I could see this little thin line where it was resting, but it took me a while to grab hold of it without launching an app from the dock! I finally got a corner of it and i was able to drag it to the right, so now I can finally play with it! It is trivial to add a new note in sidenote – you simply click the little plus button. you are prompted to enter a name for the note, with a default option of the current date and time. Once your note is there, just start typing away. You can mess around with the fonts, set rulers, and change the background colors. Sidenote auto-saves, but they even give you a save button in case you’re working with a particularly recalcitrant application and are worried you’ll lose your notes. You can email the note with a single click, or you can export it directly to disk. the file that gets emailed and the file that gets exported are both what’s called an RTFD file. You’ve probably heard of an rtf file, that’s rich text format which is a standard in the industry that every text editor can read. I had to look up rtfd, it turns out it’s an rtf directory. the idea of this format is that it can contain not just text, but graphics too. when an rtfd file with text and graphics is opened on the Mac, it looks like a single file, and the graphics are imbedded in the note with the text. I exported one of these rtfd files and opened on Windows (in Parallels) and in there it looked like a folder. In the folder were two files, an rtf text file and a jpeg graphics file. When I opened the text file, it only had the name of the graphic in it, but I was able to open the graphics file separately. Not as convenient, but maybe Microsoft has plans to support this format in the future. So are you on a Mac and you have Windows friends you wish you could do video chats with but they don’t have iChat? Or you’re on Windows and you wish your Mac friends had MSN Messengeer for video chat? 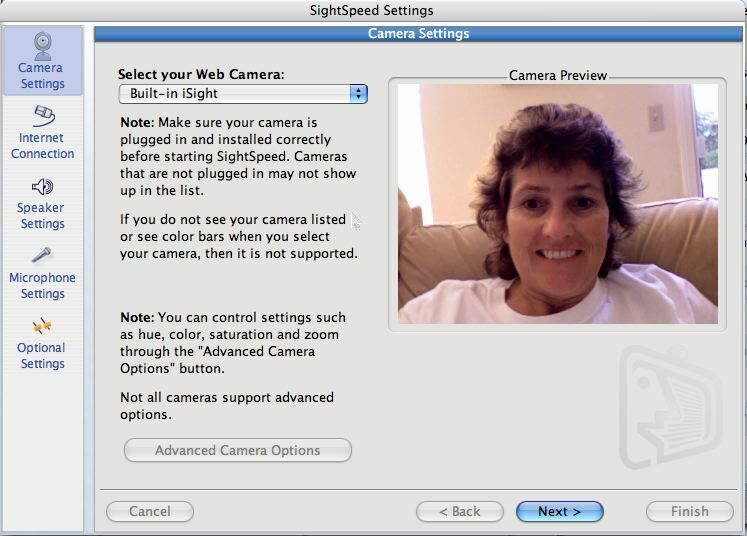 Have you tried using AIM video with iChat and after HOURS of fiddling finally got it to work, but the video was awful and besides you could never figure out how to get it to work again? 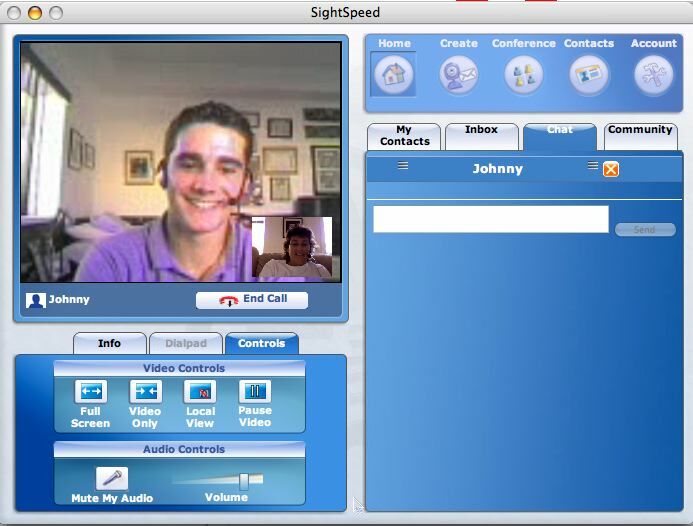 Welcome the free software and service called Sight Speed from sightspeed.com that allows video and audio chat for free on both Windows and Mac. I first heard about Sight Speed from Amber MacArthur on Call for Help with Leo LaPorte. I downloaded Sight Speed and created a user account. they email you a confirmation to which you must respond in 24 hours or the account is killed, but they let you use the software right away without waiting for the email. It IS a little tricky to find the free version – they keep giving you more options to pay for the premium version. the free verison gives you unlimited audio and 1 on 1 video calls, and lets you create video mail messages of up to 30 seconds in length, and store video mails for up to 30 days. The premium version adds the ability to do unlimited multi-party calls, your video mail messages can be up to 2 minutes long, and you can save video mails for the life of your service. this premium service is $50, and includes priority tech support. Installation was a snap, and very entertaining. It brought up several interesting windows during the setup. It checks your video and shows you a picture and asks you if it looks ok. they also show you what “not ok” looks like – upside down, black, or with junky lines running through it. Once you say it looks good, it shows you your image back at you from your camera. Then it goes through an audio check – both your ability to hear a recording and for you to make a recording from your mic. You tell it how good your connection is, I presume so it can cut the frame rate down if you don’t have a great connection but still give you passable video. Once this is all done, you’re on the air. Just like all of these kinds of programs, you have a buddy list, which comes pre-populated with a fish tank you can watch with actual fishies in it, and tech support you can call. I’m betting that the free version doesn’t let you call that number though, or maybe you’re just last in line because you don’t have priority tech support. Now I needed someone to video chat with. I thought about clicking the community button, but that can be so scary, I started trolling my ichat list for someone who uses a PC and who is a good sport with some patience. I found my victim, my daughter’s friend Johnny. He’s worked really hard to get AIM and iChat to talk to each other, so I thought he was a ripe victim. He readily agreed to give this a shot, and in just a few minutes he had it installed on Windows. We both launched, he called me right away by putting in the email address I had used. the picture looked REALLY good, much better than I’ve ever seen on AIM. to be fair, we might be on the same network subnet because he’s only a few miles away, but it really looked good. Oddly it was the audio that was a bit crunchy sounding. I’ve seen bad video with good sound but never the other way around. I put a screen shot of the two of us chatting so you can see how good it looked. You have choices of how to view the other person, you can make it full screen (which is not very high quality), see just the video in a small window, or to see the video along with all the controls. 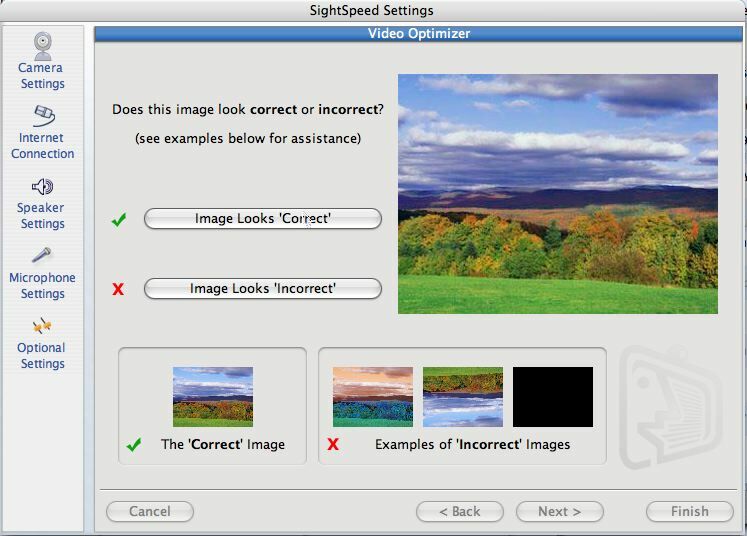 Overall I found Sight Speed to be a great application filling a real need I have. It was easy to install, trivial to set up, a snap to call someone, and the video was excellent with passable audio. and it’s free!!! What more can you ask for in an application? We’ve talked before out wiki’s – that’s the collaborative type of site that allows anyone to provide content who feels they have the knowledge. As anarchy-like as this sounds, it’s actually very successful, because the truly knowledgeable can simply edit out the goofy people so it’s self correcting. The most famous wiki is wikipedia, which in tests has been shown to be slightly more accurate than the printed encyclopedias. “Imagine a world in which every single person is given free access to the sum of all human knowledge. That’s what we’re doing. And we need your help. The 8 wiki’s include Wikipedia of course, but the other 7 are interesting too. There’s wikispecies which is a free and open directory that will cover Animalia, Plantae, Fungi, Bacteria, Archaea, Protista and all other forms of life to the extent that their users allow them. So far they have 64,795 articles. Isn’t that cool? I wish I had access to that when I was in school! open-content textbooks that you can edit. Of course most books can’t be in here, but there are over 1000 books in there, and they have them nicely categorized by Natural Sciences, Social Sciences, Computing, Humanities & Arts, Special Groups, and Miscellaneous for whatever didn’t fit in there. That looks like a fun place to find good information! There’s wikisource but the description is so vague I can’t figure out what it IS. the main page says “Wikisource is an online library of free content publications (see the inclusion policy) collected and maintained by the community.” Uh, ok, what’s free content publication? what is the content about? Is it content that was not included in a book? Everything I read talked about how you could help, like help them design a logo, or how to help them sort and categorize content, but I couldn’t figure out what the actual content was. wikinews sounds a bit more useful, I can even figure out what it is by the title. Wikinews is “the free news source you can write!” This really tests the wiki model – will you trust news written by just anyone? It’s a funny question in light of how often recently the professional news folks have been caught with highly inaccurate content. But for some reason we still trust them, right? Wikinews will probably be a site I’ll come back to – plus they already have a cool logo. Finally the 8th in the set is wikimedia which we’ve talked about here before, it’s a database of over 800,000 free images. It’s a good idea of you need an image for your website or something to start here to make sure you don’t infringe on someone’s copyrights. The picture of the day when I wrote this up was an awesome picture of Denmark from space! I also found a great collection of fractal images in the mathematics category. ok, so I’m a geek, ok???? This next tip is how to watch YouTube videos on your iPod. It’s for both Windows and Mac, and it’s from an article in Wired Magazine in their August 2006 issue (that’s the one with the picture of Stephen Colbert on the front cutting an iPod in half.) The idea is that you’re going to find a video you like in YouTube, download it to your computer, and then convert it to the iPod video format. I have to get in a little dig on Windows of course, the instructions are over twice as long for Windows as they are for the Mac. That’s life under Windows. 1. For Windows, launch Firefox. Add the Greasemonkey extension to Firefox (if you don’t know how to do that, go to podfeet.com and go to show #19 on November 27th, 2005 and you can read a tutorial I wrote on how to do it. I put a link in the shownotes to that show. 2. Go to userscripts.org and install the Download YouTube Video script. 3. the next time you watch YouTube, you’ll see a Download Video option beneath the screen. Click it to save the file to your desktop. Note that the file name will be some random set of numbers and letters followed by the .flv extension. 1. For the Mac, launch Safari and go to a YouTube video you like. Wait for it to load completely (keep your eye on the grey progress bar). Under Window in Safari, pull down to Activity Window. You’ll see a long list of file names with their sizes on the right. Many of them are in bytes or kilobytes, you want the one that’s in the megabytes, or MB’s. 2. Find the biggest file, and double click it. That will download the file to your download folder, and just like on Windows the file name will be gibberish followed by .flv. 4. Download and install the free iSquint video converter from isquint.org. Now drag your downloaded .flv file onto iSquint and iSquint will launch. Wired didn’t say to do this, but I clicked the Add to iTunes button and the H.264 encoding button, and left the radio button set to Optimize for iPod. I also dragged the quality setting to high, but i doubt this made much difference as YouTube uses fairly bad quality Flash. Next click Start, and your video will in your iTunes video folder ready for downloading to your iPod. I didn’t get a chance to test the windows process, but I tested the Mac steps and it worked really well! I went to Youtube and loaded up the wonderful Numa Numa song guy (if you haven’t seen it, go right over and watch it right now, it’s hilarious!) Once it downloaded, I looked at that Activity window, and while it wasn’t easy to find the right file, I was able to pick it out eventually. Double clicked it, renamed the file, dragged it on iSquint and clicked start – and shazam, next time I synced my iPod with video there it was. I’m really excited about this – really lets me hang onto some of the things that make me laugh! For about the last month or two, I’ve noticed that my internet speeds have been pretty bad. I was supposed to be getting up to 6 megabit downloads from Adelphia, but in the evenings I’ve been seeing more like 600 kilobits! I’ve tested it during the day and it will go up into the 1-2 megabit range. Finally decided to call Adelphia, only to be redirected to the new number for Time Warner. We were just moved over to Time Warner, and I was skeptical. I’ve had great service from bankrupt ISPs – we started with @home and then after they went under, we got Adelphia which was great because not only where they bankrupt but their CEO and others were imprisoned for fraud! What could be better than that? Certain that I will be disappointed by a functioning operation, I called Time Warner anyway, knowing this is going to be lame, they’re going to leave me on hold FOREVER, and there will be a nitwit on the other end when I finally get through who will tell me he can’t help me because I’ve got a Mac. Imagine my surprise when I got an intelligent guy named Evo (within minutes) who walked me through a couple of things like resetting my router by unplugging and all that. He talked about how he might need me to reboot my Mac, but that he was pretty sure that was only necessary on a PC. We enjoyed the chat about how cool that is. He was talking about his brother who is a Mac tech, and he had asked him if you ever have to reboot the Mac to fix a network issue. He said his brother said, “not usually”. He berated his brother for not giving a definitive answer, but I explained that what he meant was “you don’t have to reboot until you can’t think of anything else to do! Evo then had me bypass my Linksys router and go straight from the modem to my laptop. the laptop would not pull a valid IP address, so very sheepishly asked me if I would reboot! We had a good laugh while I did just that, which gave me a chance to chat up with him a bit, and I found out he’s getting an Intel-based Mac, which of course opened the door for me to tell him about my podcast! boy I don’t ever let an opportunity slip by, do I? And of course the punch line is that when the Mac came back up, it had a valid IP address. He then had me log into Speakeasy.net to test my connection (still bypassing the router). The display on speakeasy is so cool – it’s like a speedometer that goes up and up as it measures your speed, very gratifying display! Testing came in over 4 megabits! woohoo! so we plug the router back in, and the speed drops back down. the guy is very nice about it, but he suggests maybe a firmware upgrade, but he has fixed my problem as far as he can. Off to Linksys to download a firmware upgrade, which I install…and then I can’t pull an IP address at all. ARGH! I screw around with it for a couple hours, and then I remember when I was at a friend’s house last nite seeing a Linksys router in a box that they weren’t using. I ran over to their house, borrowed it and swapped out the router. And I still can’t pull an IP. I swap out ethernet cable and it doesn’t fix it, so now I’m stumped. Now my little friend Evo had warned me that if I ever had to call back to Time Warner, I shouldn’t try between 4 and 9 because I’d be stuck on hold too long. Well, it’s 5:30 and I can’t face 4 hours of downtime, so I call anyway. In less than five minutes, a lovely woman named Kim picked up, and explained that I have to power down the modem as well as the router. And of course shut down my Mac. I don’t argue, I power everything down, then power up the modem, then the router, then the Mac, and shazaam, I’m on line! the bottom line is that in two tech calls I was taken care of quickly by helpful, well informed people who knew exactly how to solve my problem. AND, I’m getting over 4 megabit downloads. thanks going to wrap it up for this week’s NosillaCast, I’ve really had a lot of fun with all of you sending in such great tips and suggestions, keep up the good work! If you’ve forgotten the addresses – try allison@podfeet.com for emails, and nosillacast@gmail.com for audio feedback. thanks for listening, and stay subscribed. i have a ipod and squint woould the perfect solution but i don’t have an i mac what program would work the same way for windows? Henry – I’m kind of confused by your question – the tutorial above explains exactly how to do it with Windows using Greasemonkey and Super video converter. Can you elaborate on where you’re stuck?